As an insurance billing consultant, one of the most frequent questions I receive from therapists all over the country has been how to bill for couples and family psychotherapy sessions that are longer than a routine 45 to 60 minute session. Therapists find longer couples and family sessions beneficial for a variety of reasons, such as being able to do more in-depth assessment and treatment, to have more time to work with a high- conflict family and resolve conflicts in session, to allow for a larger number of session participants, or for certain treatment types such as Gottman Method Couples Therapy. In addition, when clients are not able to come regularly or must come from great distance, longer sessions allow more to be accomplished in fewer sessions. So, what billing code should be used for extended family or couples sessions? The American Medical Association (AMA) clarified in 2016 that CPT codes 90832, 90834, and 90837 were individual therapy codes, and should only be used for a family session if a family member comes once or occasionally into a session where ongoing individual therapy is taking place. In that case, the family member would be serving as an “informant” to the individual treatment, or might be receiving a summary of the individual’s progress. In addition, the identified client who is the focus of the individual sessions must be present for a majority of the family session. 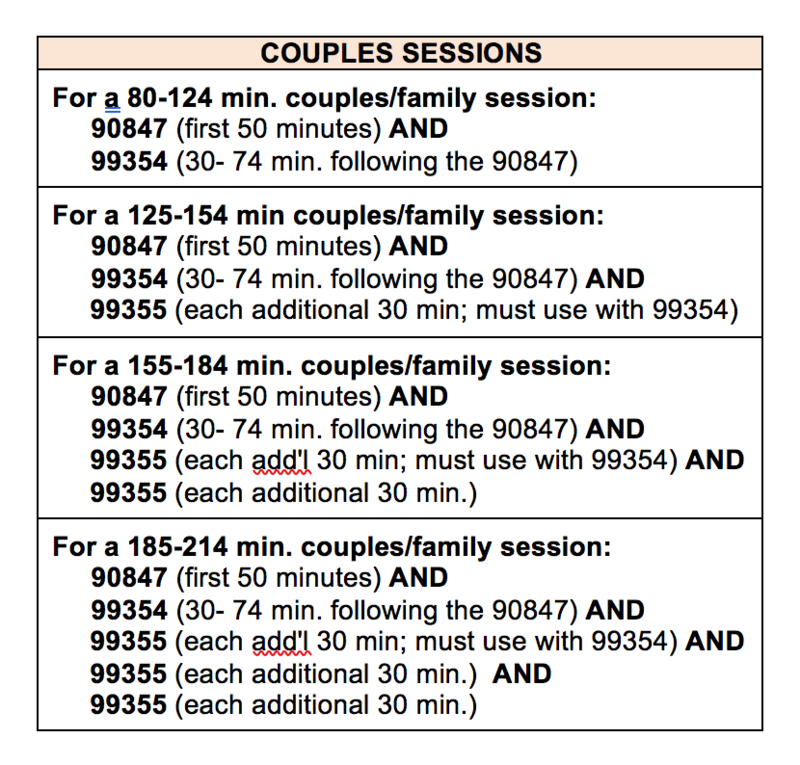 This ruled out the use of 90837 for ongoing family or couples sessions, leaving only two CPT billing codes for these sessions — 90847 (couples or family therapy with the client present) and 90846 (without the client present) — which they clarified were 50 minutes each. A new billing possibility for extended therapy sessions emerged in 2016 called Prolonged Services codes. These two codes — 99354 and 99355 — had previously only been allowed for use by medical providers when a visit had extended beyond the typical length for that service. In 2016, the AMA allowed these Prolonged Service codes to be billed with one therapy code: The 60-minute individual therapy code 90837. But here’s the good news: As of January 1, 2018, the AMA extended the use of these codes to the 90847 couples and family therapy code. 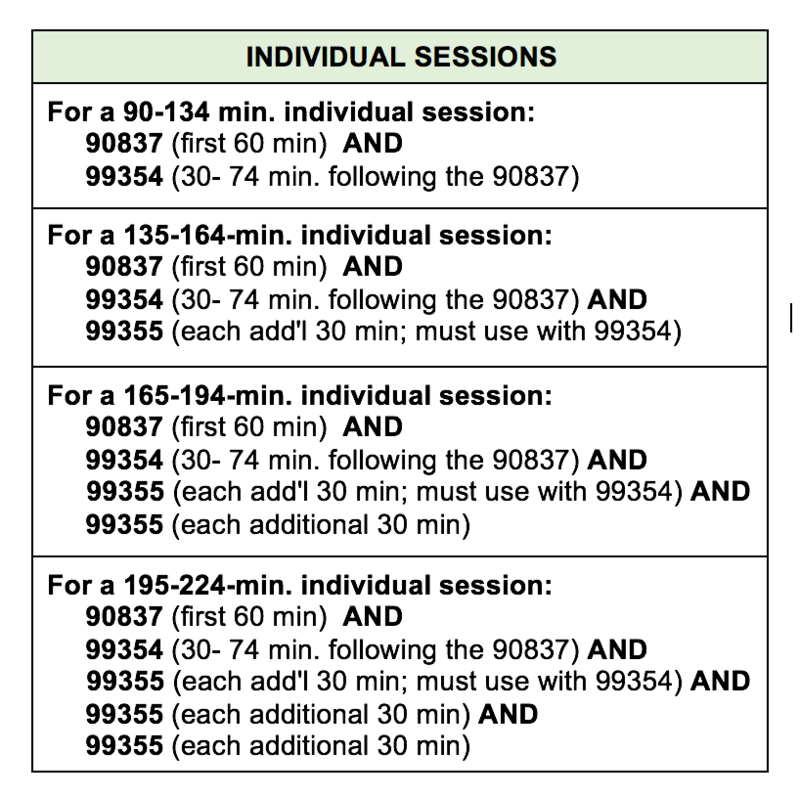 The session must be a minimum of 30 minutes beyond the original code.This means, for use with a 90837 (60-minute individual session code) the session minimum would be 90 minutes; since the 90847 couples/family session code is 50 minutes, the extended session must be a minimum of 80 minutes. Billing requires the use of multiple CPT codes for the same session, each code having its own charge chosen by the therapist. Thus, multiple lines for the same date of service will be used on the claim form or statement. Prolonged Service codes are “add-on codes,” which means they cannot be billed alone, and must always be billed together with the 90837 or 90847. When used, the 99355 must always be billed with the 99354. Below are two charts, the first showing how to bill for extended individual sessions and the second for extended couples and family sessions. Note that the time ranges are slightly different since the initial codes 90837 and 90847 vary in their time length. Will insurance plans reimburse for Prolonged Service Codes? When using these codes, it is recommended that coverage be verified in advance with each insurance payer, checking each client’s specific plan as well as whether they are reimbursed for your license. Some therapists who have used these codes have happily reported that they were reimbursed for the Prolonged Service add-on codes; others have stated they were reimbursed only for the initial 90837 or 90847. Thus, it would appear that there is nothing to be lost by utilizing these add-on codes on a claim, invoice, or superbill. Have you tried billing for these codes? Let me know which codes you used, what insurance companies were billed, whether they paid, your license, and your state. Thanks! Barbara Griswold, LMFT is author of Navigating the Insurance Maze: The Therapist’s Complete Guide to Working with Insurance – And Whether You Should, now in its 7th edition. In addition to her practice in San Jose, CA, she provides consultations about insurance, progress notes, practice building, and difficult cases. Visit her website at www.theinsurancemaze.com to read other helpful articles, schedule a consultation, or subscribe to her mailing list.